Children usually learn how to count money in second grade. 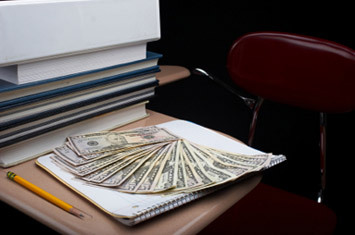 However, because counting money involves a variety of skills, the foundations are established in even earlier grades. Skills involved include identifying coins and bills, adding and subtracting, skip-counting (by fives, tens and 25s) and making change. One of the most important teaching aids is fake money. Many teacher-supply stores sell plastic coins, or you can download play money templates from a variety of Internet sites. It's best if you can have enough fake money for your child to have his or her own set. Some children may be familiar with money before it's formally taught in second grade. To activate prior knowledge, start with pennies and work up to larger values. Even though you'll be using fake money, it's often helpful to at least show your child what the real money looks like from pennies up to $5 or $10 bills. Students usually learn to skip-count by fives and tens in second grade. If they don't already know how to count by 25s to 100, consider teaching this to your children now to facilitate counting money. Students are usually taught the concepts of adding and subtracting in kindergarten. In first grade, they likely learn to add using numbers up to 100 and subtract multiples of ten from numbers up to 90. As a result, by the end of first grade, they should know enough math to do most money calculations. They should be fluent in all the necessary concepts by the end of second grade, even doing many of the calculations mentally. Although they may not formally work with decimals until fourth grade, that shouldn't hinder their ability to learn to count money and make change before that. If they can skip-count to 100 by fives, tens and 25s, they can learn to make change. You can set up a store at home to help your child practice counting money. You can have students cutout pictures of items from magazines to 'sell' in your store. Whenever your child 'purchases' something from the store, have him count out the money as he pays for it. In this case, he will start with larger denominations, and work his way down to the smaller ones. He will use skip-counting at times during this process. Then teach your child to make change as the 'sales person,' again using skip-counting. Start with the amount the item costs and add coins and bills until he arrives to the amount of money he received from the 'customer.' For example, assume the customer handed him $5 for an item that cost 26¢. Use the following steps for calculating the change. *Give back nickels, one at a time, saying, '35, 40, 45 and 50¢. Have your child practice paying for goods and services at home using play money. For example, you can assign costs to pencils and paper, and your kid pay for them with her play money. You can also use play money as 'salaries' for chores performed. If she doesn't do a chore well, she'll get charged a fee. Have something she can buy with the 'money' earned, such as 30 extra minutes watching TV or going out for ice cream with mom or dad. Memorization is not a truly effective way to learn math. Interactive exercises and experience are the best ways to learn and truly understand mathematics. Read on to learn more.